Will Catalonians Be the First Successful Separatists to Join the EU on Their Own? A white star against a blue background stands atop narrow red and yellow stripes. This is a slightly tweaked version of Catalonia’s flag: the added white star and blue triangle stand for Catalonian independence. On September 11th, all that commands more attention than the myriad flags are crowds roaring “In-! Inde-! Independencia!” But, one should query whether the Catalonian flag—adorned with the independence star or not—could ever hang in Brussels among EU Member State flags. There’s no bullfighting in Catalonia, and announcements in Barcelona’s metro typically sound in Catalan, not Spanish. 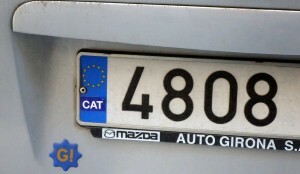 Some Catalonians have taken to covering the EU automobile license plate “E” (“España”) with a decal bearing “CAT.” But what’s all the hullabaloo about seceding? At the heart of it is a conviction that Catalunya no és Espanya (Catalonia is not Spain). The Catalan People share a unique language, history, culture, flag, and general national identity. They seek to avoid assimilation into Spanish culture and dodge overt and covert attacks on expression of Catalonian culture. Furthermore, Catalonia contributes more financially to the central Spanish government than it receives. Finally, there is currently a clear majority in Catalonia’s parliament in favor of secession, though the pro-independence group agrees on little besides Catalonia’s push for independence. On the other side of the aisle, there are fears of the balkanization of Europe, selfish nationalism (“you scratch my back, I’ll scratch yours”), as well as emphasis on the shared elements of Catalonian and Spanish culture. If Catalonia were to break off, Madrid raises concerns about setting off a chain reaction, inspiring Scottish, Bavarian, and other nationalist groups to follow suit. Furthermore, the Spanish stress that, though it’s irrefutable that Catalonia currently bears a relatively larger tax burden than other parts of the country, economic cycles are a fact of life and Catalonia may very well need a helping hand from Greater Spain in coming years. In other words, that selfishness is not the answer. In addition to this, simply put, it’s good to be part of the club. EU membership gives member states access to the Single Market of the EU: a $16.6 trillion economy composed of 500,000,000 people. It grants access to a global, economically-hefty partnership that accounted for 23% of the global economy in 2012 in dollar terms. Members states also benefit from free flow of investment, labor, and technology. In short, the first group (the Purists), would require Catalonia to enter the EU in the same manner as other joining nations. That is, to stand against a requirement that all members states, including Spain, unanimously approving the nation’s entrance. This would pose obvious problems for Catalonia, since Spain has made quite clear its unwillingness to support an independent Catalonia. In contrast, the second group (the Pragmatics), argues that the EU (including Spain) would be realistic in their approach to Catalonia’s entry to the EU. Though on principle, Spain might disagree with its independence, the fact of the matter is that Catalonia is an economic powerhouse with hundreds of miles of important border territory between the Mediterranean, and the rest of Europe to the northeast of Spain. A final group focuses on the European rights of the citizens within Catalonia’s present and potential future territory: as members of the EU, they have the rights associated with EU membership, and secession of EU could not strip those rights. Thus, Catalonia would “remain” a member of the EU. Among those who opined was Spanish Prime Minister, Mariano Rajoy, in 2012. He stressed that an independent Scotland would be left out of the EU. Undeniably, nervousness colored his words as he must have been contemplating Catalonia’s own stirrings for independence. Blessing Scotland’s secession and reentry could have been construed as supporting secession movements in his own country. However, Spain’s message was inconsistent. Just one year after Rajoy’s anti-Scottish secession comments, Spain’s Foreign Minister Jose Manuel Garcia-Margallo made it clear that Spain would not block Scotland’s reentry. What seemed to distinguish Spain’s change of heart was that the U.K. was on-board with Scotland’s secession. Spain seems to be suggesting that, as long as both parties to the break-up consent, it will not use its mighty EU membership veto. This rule distinguishes its secession-friendly opinion of the Scottish case with its unity-only opinion of the 2008 Kosovo case and its own Catalonian and Basque cases. In short, Spain made the case that, if Scotland or any other nation were to break off from another nation, it itself would not support that nation’s reentry into the EU if the secession were not blessed by the parent nation’s government. So, Spain has sent clear direct and indirect messages that it will not support Catalonia’s entry into the EU. In effect, this would make it impossible for Catalonia to enter the EU. However, assuming that Catalonia did petition to enter into the EU (a question for another discussion), I suspect that it would be able to make that entry. For one, there are pragmatic (economic, travel, and other) reasons for EU nations, including Spain, to want Catalonia in the EU. In many cases, pragmatism wins. Among such pragmatic arguments is the reality that Catalonia is an economic powerhouse both within the EU and within Spain. It has lots to offer the Union. Furthermore, Catalonia’s independence is in line with principles set forth in Article 3 of the Treaty on European Union, which urges that the EU “shall respect [the] rich cultural and linguistic diversity [of Europe], and shall ensure that Europe’s cultural heritage is safeguarded and enhanced.” Finally, there’s precedent of another EU nation (the U.K.) blessing the reentry of a nation that broke off from it. The U.K. is a powerful force in Europe, and following its lead might be in the best political interests of an EU member like Spain. In short, Madrid talks a big game. If it were to set out to block Catalonia’s reentry into the EU, it could. It has made very clear that it can and may do this. However, when the clock strikes twelve, it will be beneficial to Spain and Europe for Catalonia to remain within the Union, and in accordance with some very important principles in the Treaty on EU. Catalonia would, at least eventually, be permitted to rejoin the EU. ← TPP: What Can the Trans-Pacific Partnership Negotiations and News Coverage Predict for TTIP?